» Knowledge superpower by 2020? Simple UI for a great utility that _just works_ using LuPy. 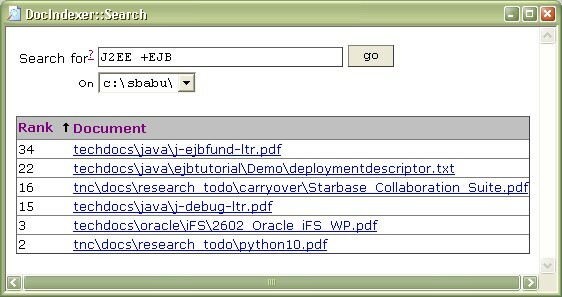 DocIndexer is a toolkit for indexing and searching document directories. DocIndexer includes command-line utilities, Python file index and search classes plus a Win32 COM server (for scripting from languages such as Visual Basic) which can be used to integrate indexing and searching into application software. The current version has built-in support for Microsoft Word, HTML, RTF, PDF and plain text documents. Once the indexing is done, the search is very fast. I used it for 2 days and already can’t live without it. The search results come up in a DOS window; which makes it difficult to actually pull up documents from the search results (Mark - Copy - Paste). So, I wrote a quick HTA to act as a front end for docsearch.exe. Obligatory screen shot is below. I like it already! If you are looking for something similar, go ahead, grab it and feel free to modify it. I don't want to sound ignorant, but what is HTA? Can't you use the python script and not have the results come up in a dos window? Andy (#1), HTA is HTML Applications. These are simple web pages with extension .hta. You get a full VBA/JScript scripting environment with not much security restrictions (like launching external programs). So, using HTML as the UI builder and VBA/JScript as the client logic handler, you can easily make small applications. It works only in Windows though, with IE5+ installed. I like HTA technology, because it is script-based, builds upon HTML and makes deployment a non-issue. Coupled with WSH, it provides a decent "quick-n-dirty" development scheme. Maniac (#2), yes it is possible. I had done that before with wxPython. Another option is with Tcl. But hey, I didn't want to spend much time packaging it (freezing the python app, making installer etc.). This way, just give people a Zip file and 2 lines of instructions and that is it! Ramon Felciano quickly made my code less dirty by adding error catching and accomodating paths with spaces. Please contact the server administrator, webmaster@vsbabu.org and inform them of the time the error occurred, and anything you might have done that may have caused the error.